When I began in ministry, back in 1997, (oh my!) children’s churches weren’t wildly popular in my area but over the years, the trend has caught on. Now I am happy to report we have some amazing ministries that reach children of all races and social situations. I am blessed to have been involved with some of those. A well run kid church can be a major assent in your church and a tool God uses to tell children about Jesus. Our young people are so blessed to belong to faith communities who love them enough to teach the Bible on a level they can understand and enjoy! 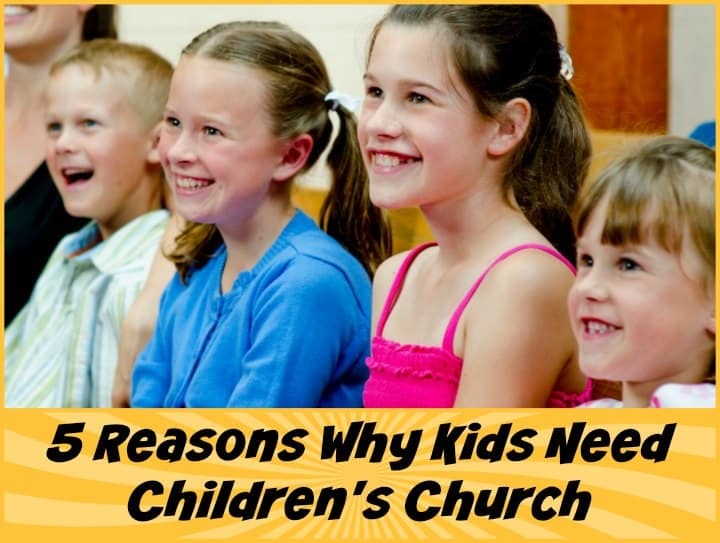 Should a parent send their child to children’s church or keep him or her in big church? According to some recent blog posts I’ve read, many parents are abandoning their support for children’s ministry and keeping their kids in the adult church services. Not only that but they are encouraging others to do the same. That’s fine and that’s certainly their choice but I find some of these church purists’ attitudes a bit shocking. Especially the practice of shaming parents for their perceived lack of commitment to their children’s spiritual life. How dare someone label a parent as lazy or immature because they take their child to children’s church? And I have to ask myself, how in the world did we get here? Aren’t we all co-ministers of the gospel? 1. Christian children need socialization / peer fellowship too. Many parents homeschool their children and the socialization aspect of children’s church is a major plus for these kids. These parents need you and your ministry. 2. Christian children need the community to stand with them. While in public schools, children are bombarded with confusing messages about gender, sexuality and so much more. In children’s church, they learn that it is okay to stand up for what’s right and they see how they can do it by watching other children. Just like adults need fellowship, children do too. 3. Children don’t need to be “preached at” to be inspired. There, I said it. Children learn differently. Let’s teach kids the way they need to be taught. If they were in school, they wouldn’t just sit at a desk all day and listen to the teacher drone on and on. They would be at learning centers, trying hands on experiments. They would be doing all those things. Not being preached at from a faraway pulpit. Or worse learning to fake listen like too many grown-ups in our congregations. 4. Jesus encouraged us to let the children come to him–and do not hinder them! Here’s the actual verse in Matthew 19:14,”Let the little children come to me and do not hinder them for the kingdom of heaven belongs to such as these.” What was the action here? Whoever brought these children (parents? friends?) wanted Jesus to interact with them, lay hands on them, pray for them. They weren’t being led into the temple to sit on a pew. Something to think about! 5. Children need access to your special anointing. And it is special. You are anointed to minister to children. God is aware of our culture. He is aware of our current methods of ministry. You have been put here on purpose for an on-purpose reason. No matter who speaks against your ministry, you are called by God to stand in the place you serve. Don’t give up. Be encouraged. You are a blessing. None if this trumps a parent’s personal conviction. Only the parent can know if their child is “getting it” in the big church experience. The best models we’ve seen blend the kids into the adult service increasingly as they mature. So maybe preschoolers get some songs, younger elementary stay a little more, older elementary is there most of the time. Every church is working on a balance. At what age/grade do you think staying in church works? I am keeping my kids in 7th grade and up in church and got a little heat about the 7th grader not being in Children’s church but she and I felt it was time. I have one two years younger and am thinking that by 7th grade she may want to join us in staying in church as well. I couldn’t imagine NOT being in church when I was in 7th grade! Is it any wonder that the majority of children in the rising generation have no interest in church. We’ve trained them that way. Boy oh boy. I have many comments to make in regards to each of your points, but I won’t bother addressing them point by point. I do want to say that it is very easy to assume from this article that you believe that there are NO benefits to children playing an active role in worshiping with an intergenerational community. Not the scope of your article I suppose. But nonetheless, seems like you hold low regard for intergenerational worship. The fact that you call it ‘big church’ rather than worship or corporate worship is setting a tone of disdain. I’m also wondering if the ‘getting it’ you mention is the right ‘getting it’? What is it you propose the children might not ‘get’? I find it interesting that so many people believe that children learn best outside of/apart from intergenerational relationship. The trend towards peer orientation is a huge concern in our society–children in effect raising and training each other. Why on earth would we hope to recreate that trend in our churches? It hasn’t proven successful for the health and betterment of our modern society. I am a children’s pastor (in my 6th year of ministry), a parent to three children ages 10-15 and a trained and experienced teacher. I absolutely agree that children can learn well in settings that are specifically designed for them with content prepared with their learning needs in mind. I agree that they definitely need that and I support that 100%. But I’m wondering why we couldn’t at least consider the option of having age specific learning times that do not overlap with family worship? I think we are losing more than we are gaining by approaching this with a one or the other attitude. Why not both? Why not non-integrated, non-intergenerational learning AS WELL AS intergenerational worship? Why could we not challenge our ‘droning’ pastors to prepare messages that engage the entire community/family. I think we are aware that many adults are even less attentive than our youth and even some of our children . . . perhaps they would benefit from more creative approaches to teaching as well. Question: do you go to church to be inspired? Perhaps we need to re-examine the purpose of corporate worship and the mission of the church . . .
Also, I do think it is true that children are challenged by their teachers from K on to learn to sit still and listen for longer and longer periods of time. They are expected to be able to listen to instruction for periods of at least 15-20 minutes by 5th grade. So, yes, they do sit in class at school and listen to their teacher drone on and on. Instead of catering to what we believe to be their needs, I wonder if we might at least challenge them to practice respect, stillness, and critical thinking (age dependent of course) when listening to an adult teach from that far away pulpit (also if attentiveness is difficult because the pulpit is so far away, why not sit closer to the front with your children? You might find it easier to pay attention too). Just a few ideas to push back a little bit. As I said earlier, I fully support age-appropriate, purposefully prepared learning sessions for children! I really believe that spiritual formation happens in many contexts, not excluding intergenerational worship. There is a richness there that may profoundly influence the faith journey of a child. I am aware that many of you reading this will disagree with me. I’m okay with that. Tony Kummer (Editor) reviewed & updated this page on : June 9, 2016 at 9:49 pm. All our content is peer reviewed by our readers, simply leave a comment on any post suggest an update.